Over the past couple of weeks I have been getting squash on a regular basis from my produce delivery. I’ve been having fun trying to come up with creative ways to prepare them. These butternut squash crisps are a cross between potato chips and potato wedges, but with squash. They’re a fun way to enjoy this popular fall veggie. My son loves sauce so if you or your kids are the same way serve it with a little side of ranch. Happy dipping! Note: For a crispier squash cut the slices thin otherwise they may come out soggy. Peel the squash using a vegetable peeler. Cut the ends off and slice in half lengthwise. Scoop out all the seeds and stringy pulp. Cut into 1/4” slices or smaller. The thinner they are the crispier they will be. Put the slices of squash in a bowl and drizzle with olive oil. Toss to coat evenly. Spread the squash out in a single layer on a parchment lined baking sheet making sure they don’t overlap. You may need to use two sheets. In a blender pulse together breadcrumbs, parmesan, garlic, parsley, thyme, salt and pepper. Sprinkle the topping over the squash slices. 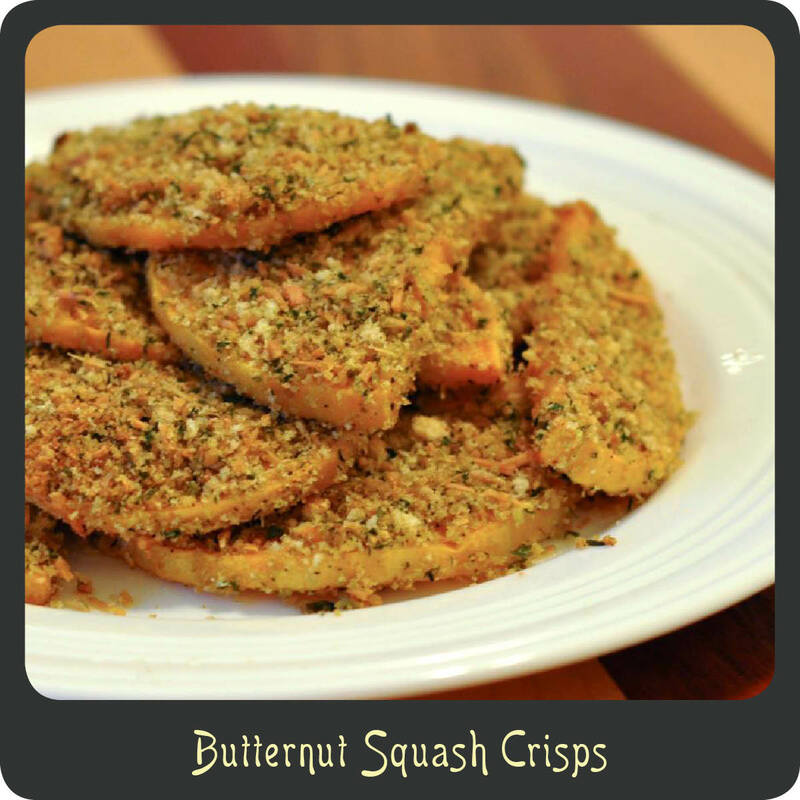 Bake squash for 25–30 minutes until the tops of the “crisps” are golden brown. This looks great ! I have a bunch of butternut squash from the garden and only have one tried and true recipe that I actually like…..looks like I might be adding a second to my arsenal.